2018 has been an exceptionally busy year, in part because I’ve had the privilege and opportunity to spend so much time with members of the MRG community all over the world. . What a joy it is to come together and learn from each other! 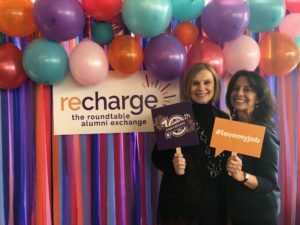 Earlier this month, I headed to Toronto, where I had the pleasure of presenting at The Roundtable’s “Unconference,” ReCharge. The Roundtable’s founder and president, Glain Roberts-McCabe, is a longtime MRG partner and friend. She shared some of her own experiences and insights as a presenter at MRG’s own conference in 2017, and I was eager to return the favor. Tricia Naddaff (R) with Glain Roberts-McCabe, longtime MRG partner and founder of The Roundtable. This event is a reunion of sorts for leaders who have experienced the Roundtable’s programs. I was amazed by how much energy and content could fit in a single day, and the “unconference” format created a participatory environment where people could exchange ideas and make meaningful connections. While several of us have spoken on the topic before, this particular presentation gave us something new: the opportunity to see the presentation come to life in vivid color, thanks to the skills of graphic recorder Erica Bota (see her interpretation below). It was exciting to see my presentation come to life in a graphic recording. While we can’t be everywhere at once, it is a joy for us to get out into the world and share MRG research and insights with our partners and their clients and communities. If you are hosting or even attending a conference where you’d like to see us share some of MRG’s research insights, please let us know – we would love to explore these opportunities with you. 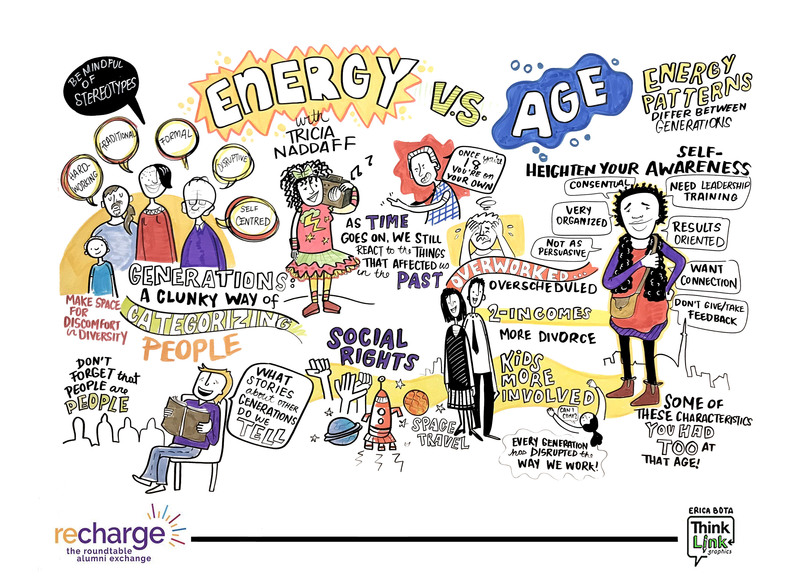 And if you’d like to see more of the graphic recordings from the event, visit the Roundtable website – it’s a fun and fascinating format to explore! As president of MRG, Tricia uses her penchant for bursting into song and bringing out the best in people in approximately equal measure.